20 November 2019 - 4 January 2020: 3:30pm (last entry 3:00pm) The Gardens are closed on 24 & 25 December 2019. 01 - 28 February 2020: 5:00pm (last entry 4:00pm) Glasshouses will stay open until 4:30pm during orchids. 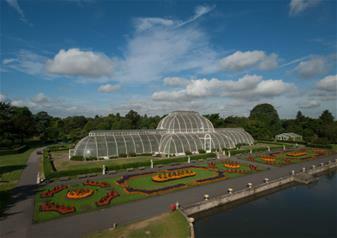 Kew’s Royal Botanic Gardens are set in 300 acres of stunning landscape, comprising 6 sparkling glasshouses, 30,000 different kinds of plants and one of the largest herbariums in the world! Located beside the River Thames between Richmond and Kew in south-west London, the Gardens boast hands-on seasonal attractions and fun activities. The entrance fee also includes the breathtaking Rhizotron and Xstrata Treetop Walkway, which takes you on a tour both underground and 59ft up into the trees for unbeatable views! Built as a private house in 1631, Kew Palace was used by the royal family from 1729 to 1818. An intimate former home, Kew Palace was used by George III, Queen Charlotte and their 15 children. See the king’s personal artefacts during your visit to the palace and wander through the colourful recreated Georgian rooms, before taking a peek inside the Royal Kitchens for a captivating insight into Georgian culinary life!